The uber talented singer-songwriters Tom Grennan and Jade Bird will both perform support slots ahead of the Stereophonics gig on Thursday 11th July 2019. The announcement comes after Lytham Festival has experienced its highest demand for tickets ever. 2019 marks the 10th anniversary of the five-day live music event and promoters are heralding it the biggest ever with legendary rock star Rod Stewart, international pop star Kylie Minogue, 80s synth-pop band The Human League and Hollywood Proms featuring Michael Ball and Sheridan Smith all set to headline alongside Welsh rockers Stereophonics. And the addition of Tom Grennan and Jade Bird to the Stereophonics bill is set to be a huge hit. Festival director Peter Taylor said: “The reaction to this year’s Lytham Festival continues to be phenomenal. We’ve had amazing artists over the years, but we’ve never had a full line up as strong as we do for 2019. “To now be adding both Tom Grennan and Jade Bird as the support artists for Stereophonics is brilliant. Both artists are enjoying massive success and are clearly destined for incredible careers. Tom Grennan released his debut album Lightning Matches last summer reaching number 5 in the UK charts and it became the biggest selling album of a newly signed male artist of 2018. A sold-out autumn headline tour followed while Tom was also nominated as Best Breakthrough Act in the Q Awards. For Jade Bird the last couple of years have been somewhat of a whirlwind. Her debut EP Something American was launched in 2017 and she toured the States. Last year she was a finalist for the BBC Sound Of award and her debut album (recorded at Woodstock) is due out in Spring. Rolling Stone have described Jade’s music as “a young Londoner’s spin on modern Americana” while Jade herself says she’s “kind of country, kind of blues, kind of pop and kind of none of that”. 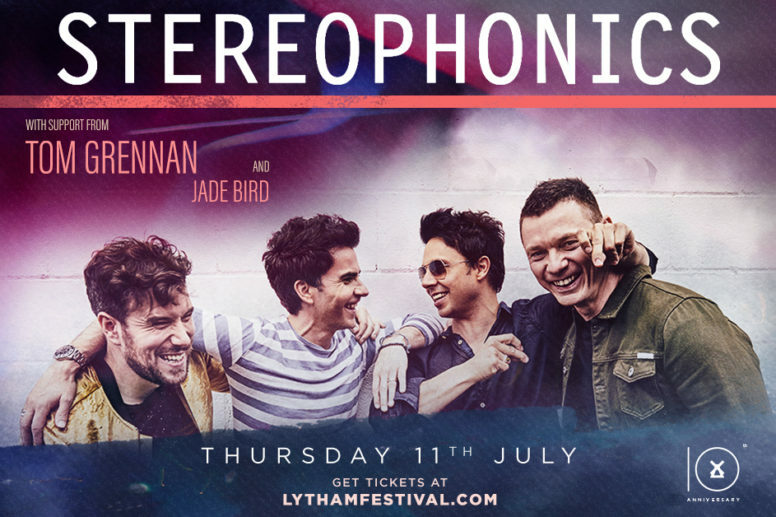 Tickets for Lytham Festival are on sale now!